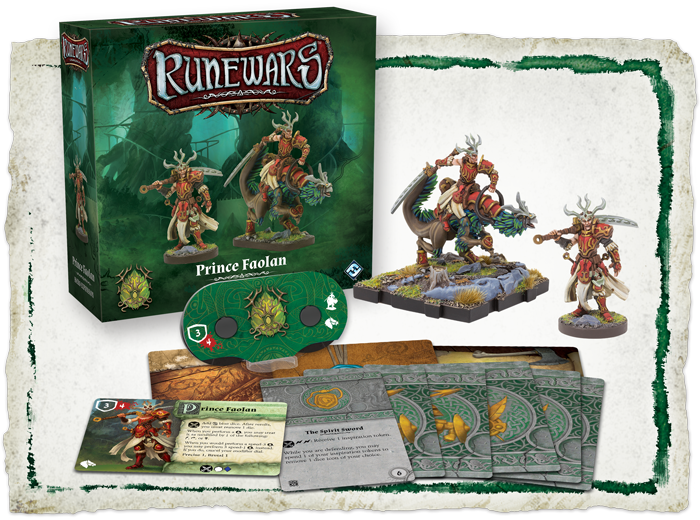 Order your copy of these Runewars Miniatures Game expansions at your local retailer or online through our website today! 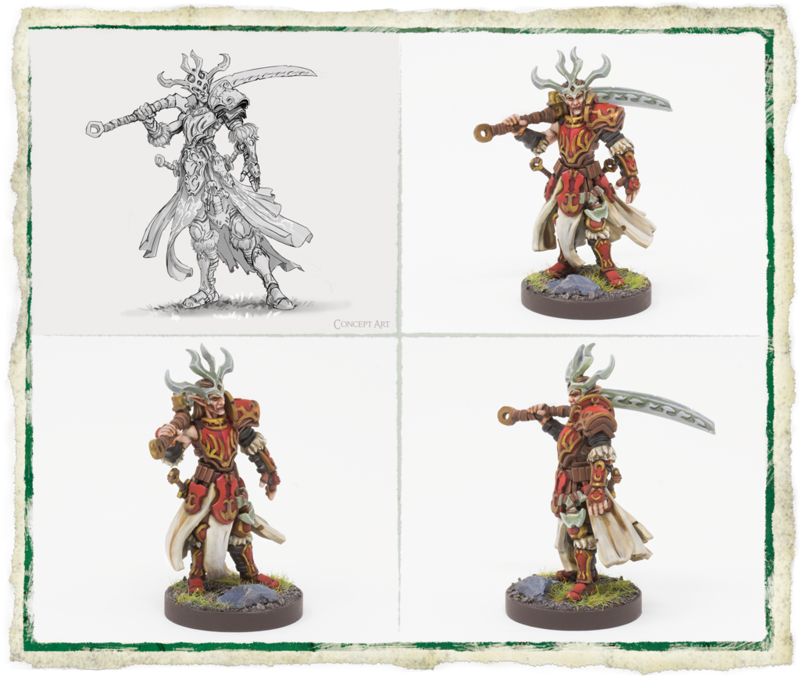 The land of Terrinoth falls into chaos in Runewars Miniatures Game! From the Mistlands in the North to the southern reaches of the Aymhelin, the wars before the four key factions of Mennara continue to rage without end. As enemies encroach from all sides, the once insular Latari Elves must call upon ever-more powerful allies to defend their people from the threats of the outside world. 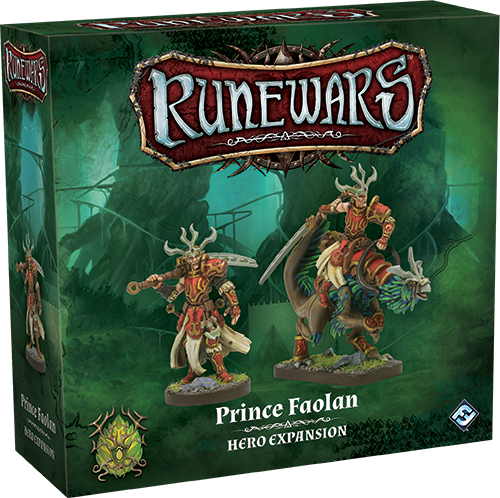 Today, Fantasy Flight Games is proud to announce two new Latari Elves expansions: the Prince Faolan Hero Expansion and Ventala Skirmishers Unit Expansion for Runewars Miniatures Game, now available for pre-order at your local retailer or online through our website! After Prince Faolan’s rash military strategies led to the death of one dear to him, he vowed to tirelessly defend his people, never risking their lives for his own glory. He sentenced himself to lonely exile and traveled the length of the Aymhelin, slaying bandits, marauders, and other trespassers with his loyal cyrssaerele, Silanel, as his only companion. As the ages passed and news of his deeds spread, he regained the trust of his elven brothers and sisters, and now he leads a great host of loyal warriors as the Aymhelin Forest falls under threat once more. Unlike the halfblood sorceress Maegan Cyndewin, Prince Faolan comes from a pure lineage, and he has all the inherent grace and speed associated with the descendants of the Empyrean. When the prince performs a march action, he may treat it as modified by either a turn, a wheel, or a charge, allowing him to effortlessly maneuver around difficult terrain or slip through an enemy’s ranks. Additionally, when he would perform a speed-three march, he may instead perform three speed-one march actions—giving him much greater range and mobility. If the prince chooses to use this ability, he must cancel the modifier on his command tool, but each of these movements can be modified by his other abilities, keeping him just out of his enemies’ grasps. Beyond these formidable abilities, the elven warrior has undergone intense tactical training that provides him with skill unparalleled in Terrinoth. 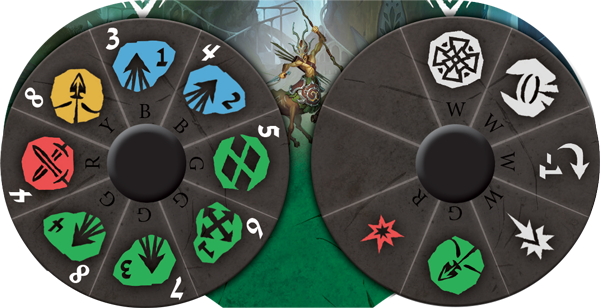 Prince Faolan’s command tool features a brand-new icon on his modifier dial—the die enhance modifier, which has never before appeared in Runewars Miniatures Game. 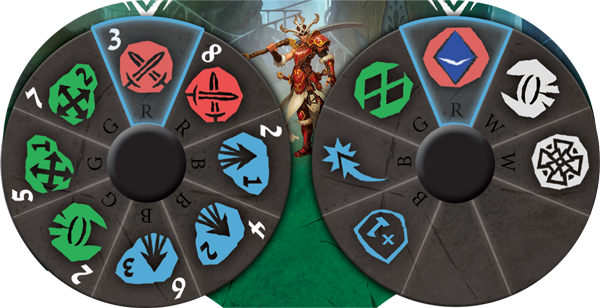 When a die enhance modifier appears on a dial, it has both a stance and a colored dice symbol (in this case, a red stance and a blue die). When a unit uses this modifier, they roll an additional die of the specified color! Normally, when Prince Faolan engages in a melee, he rolls one white and one blue die. But by selecting this modifier on his command tool, he can add another blue die to his attack. And if that weren't enough, during every melee attack, the prince adds a number of blue dice equal to the number of stable energy runes! However, this power must be tempered, and after rerolling any dice, he must remove one die. The Prince Faolan Hero Expansion provides you with two unpainted and easily assembled plastic miniatures, displaying Prince Faolan astride his steed and afoot. This expansion also offers six upgrade cards that the prince can bring to his Latari allies. Throughout the Aymhelin and beyond, Prince Faolan is known for his Legendary Prowess in combat. With this upgrade card, if the defender is not engaged with other units during a melee combat, the prince may replace one of his dice with a white or red die. The prince's prowess doesn't only cover attacks, however. 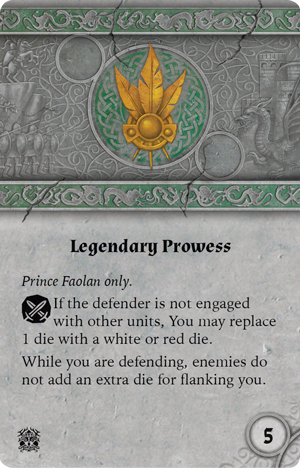 While Prince Faolan is defending, enemies do not receive an extra die for flanking him, as the power of his lineage and extensive training make him well prepared to handle conflicts on any front. Though he has dedicated his life to protecting the Aymhelin and his kinsmen, a seed of ambition grows in the prince, despite his previous losses. As the wars of Terrinoth continue with no end in sight, would the Latari not be safer under his leadership than his uncle’s? According to the Latari Loremasters, the Ventala first emerged in Mennara through the energies released in the War of the Shadow Tear. Although they have not always been allies with the Latari, a friendship between the two cultures blossomed many centuries ago, and the Ventala are proud to offer their services as scouts and warriors when darkness threatens the Aymhelin. These hoofed warriors are adept at passing through wood and plains alike, preferring to use their speed and the power of their arms to hurl javelins at distant enemies. The Ventala Skirmishers rival even the Latari’s lithe Leonx Riders when it comes to mobility. When they march, these skirmishers can choose to decrease their speed by one or treat their march as a turn, allowing you to avoid an unexpected collision or surprise an enemy with a deadly turning charge. Their command tool also features a wide variety of movement options, and their modifier dial has a stunning four white modifiers that can paired with any action. As an additional option, the Ventala Skirmisher's command tool has a green ranged attack modifier that can be paired with many of their movement options, allowing them to ride forward and hurl their javelins in a single turn. Normally, when the Ventala Skirmishers execute a ranged attack, they roll a single red die. However, this can be supplemented if they're close enough to their target for their javelins to be most effective—if their target is at range one to three, the Ventala Skirmishers add another blue die to their attack! Among the catching vines of the Aymhelin, none can stand against the swift skirmishers. 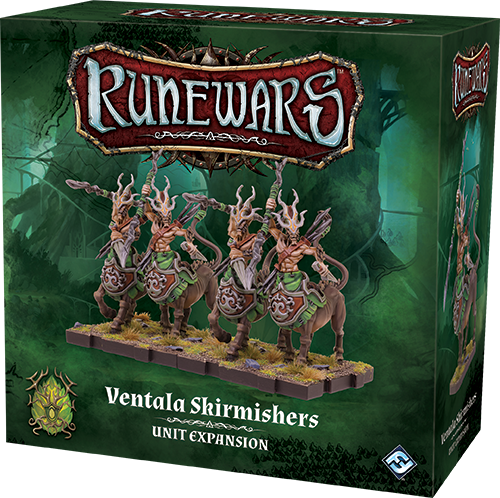 The Ventala Skirmishers Unit Expansion provides you with four unpainted miniatures for you to customize in the colors of your clan, as well as upgrade cards to strengthen your Latari army. The warriors of each clan of the Ventala dye patterns into their flanks to show their affiliations, with each clan having an elaborate system of honors and lineage that rivals the most storied heraldry of the Daqan Lords. The Grove Dancers are known for their elaborate patterns dyed in sap from newly awakened Aymhelin Scions, while the Heart Wardens, who know every secret path through the Aymhelin, mark themselves with spirals to symbolize the horn that their ancestor sacrificed in ages past. But these symbols are not merely decorative. 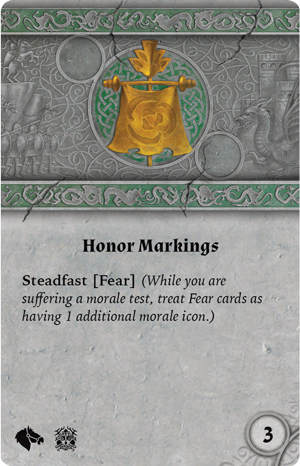 These Honor Markings help to inspire the Ventala Skirmishers when they take to the battlefield, equipping them with the Steadfast [Fear] keyword. Since the oath of horn and branch, all clans of the Ventala have been ready to aid the Latari against any threats to the Aymhelin. Now, as the warhorns sound throughout the forest, they will not shirk from their duty. With the dead emerging from the Mistlands and the Uthuk Y’llan stirring in the wastes, you cannot stand idle as threats encroach on the borders of the Aymhelin. Seek out the threats to the elves, strike them down, and defend the home of your people! 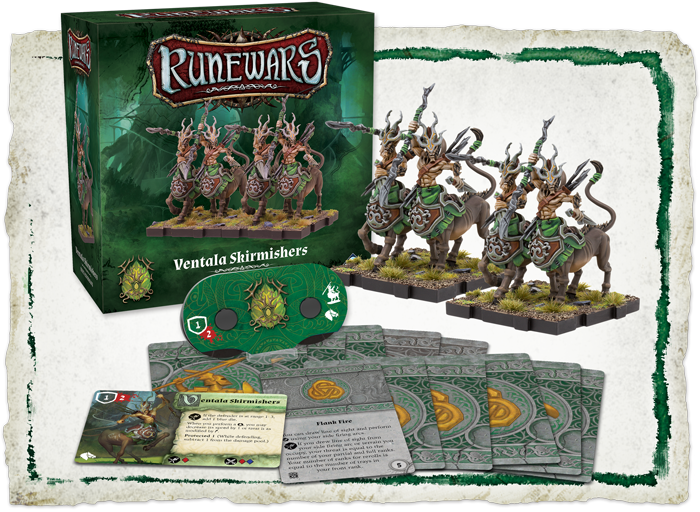 Pre-order your copy of the Prince Faolan Hero Expansion (RWM34) and the Ventala Skirmishers Unit Expansion (RWM35) at your local retailer today or online through our website here, or be sure to look for these expansions when they hit shelves in Q3 of 2018!